"I made a comment recently about getting a 100% fill in the wonderful Pilot Custom 823 and got a few PM's about that comment. I wish I could say I found this but it was downwiththepc27 that figured this out. You can practice with water before going with ink. It works incredibly well if you are careful and I get maybe a 97-98% fill. I travel a lot and this pen, once filled and with the shut-off value, is the perfect road pen. 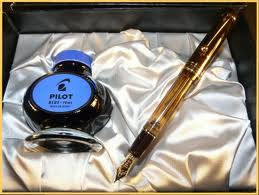 Great nib, tons of ink, low profile for "sticky hands" and the value keeps the ink in the pen when I am at 30,000 feet." Sorry the URL is too long to post. I have the clear version of this pen and it's fantastic! Mine comes with a bottle of Iroshizuku in the packaging though. Fully agree with your review. For refilling, I use a Visconti Traveling Inkpot. The Inkpot creates pressure within its sealed chamber during the downstroke of the pen's piston (when you are expeling) and with both the pressure in the Inkpot and the vacuum in the pen, helps me achieve an almost full fill every time. 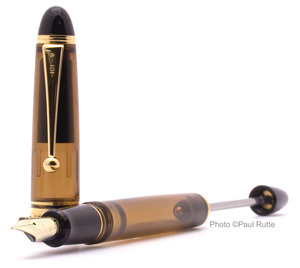 I haven't seen a Visconti Traveling Inkpot in person and didn't know it could be used with other pen-maker's pens. That's great to know. I may have to get one of those. Thanks! Nice review on the 823. I've had mine for the better part of two years (black). The M nib on mine has just the right amount of feedback on most paper to offer near-perfect control, without a hint of scratchiness. The best FP I've ever used, let alone owned.